Cisneros-Puebla, C. A. (2006). “Qualitative Computing”. En George Ritzer (ed) Blackwell Encyclopedia of Sociology. pp. 3725-3726. Blackwell Publishing. Cisneros-Puebla, C. A. (2008). “On the Roots of Qualitative Research”. En Josef Zelger, Margit Raich, et Paul Schober (eds) GABEK III. Organisationen und ihre Wissensnetze. pp.53-75. Austria: Studien Verlag. Gordon, A. D. (1990). Cluster classification. Wiley New York. Gower, J. (1967). “A comparison of some methods of cluster analysis”. Biom. J. 23: 623-637. Gower, J. (1971). “A general coefficient of similarity and some of its properties”. Biometrics 27, 857-872. 1971. Haas, W. P. (1964). “The Concept Law and the Unity of Peirce’s Philosophy”. Fribourg, Studia Friburgensia, new series, 38. López, J. (2015). “Analyse de contenu des Les Collected Papers de Peirce par SVM et forêts de décision ”, Analyse des segments trouvés par COFIEH, Peirce Rapport, LATAO, UQAM. Meunier J.-G. (1997). “La Lecture et l’Analyse de Textes Assistées par Ordinateur (LATAO) comme système de traitement d’information”. Sciences Cognitives, (22) : 211-223. Meunier, J. G., & Forest, D. (2005). NUMEXCO: A Text Mining Approach to Thematic Analysis of a Philosophical Corpus. CH Working Papers, 1(1). 33-45. Meunier, J. G., & Forest, D. (2009). Lecture et analyse conceptuelle assistée par ordinateur: premières expériences. publ., Annotation automatique et recherche d’informations. Paris: Hermès. Pons, S. (2013). Las leyes de la naturaleza en el pensamiento de C. S. Peirce, Pontificia Universidad Gregoriana, Tesis de Doctorado. Santaella B., L. (1994). “Peirce’s broad concept of mind”. European Journal for Semiotic Studies, 6(3/4), 399-411. Ward, J. (1963). “Hierarchical grouping to optimize an objective function”. Journal of the American Statistical Association. 58: 236-244. Widdows, D. (2004). Geometry and meaning. AMC, 10, 12. [CP] Peirce, C. S. (1931-1958). Collected Papers, vols. 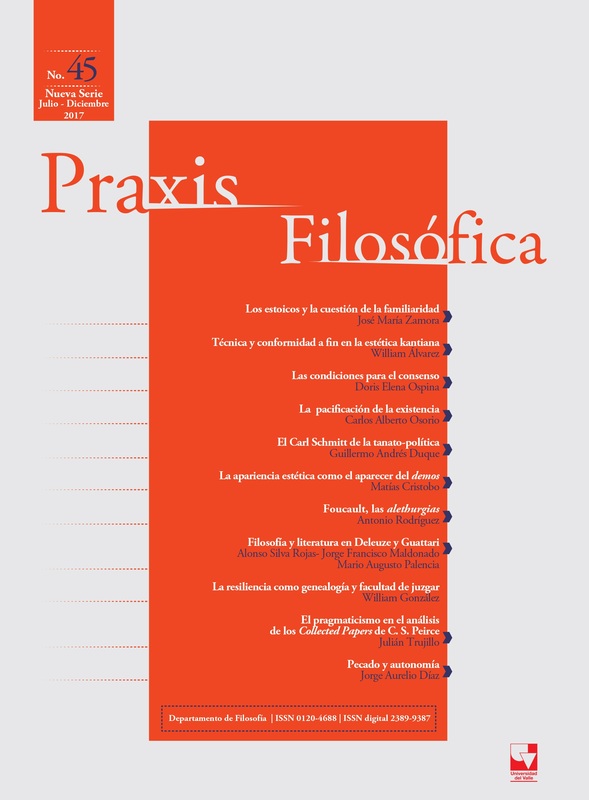 1-8, C. Hartshorne, P. Weiss y A. W. Burks (eds). Cambridge, MA: Harvard University Press. B.71.030; Edition électronique de J. Deely, Charlottesville, VA: InteLex. [EP] Houser, Nathan et al. (1992-98). The Essential Peirce. Selected Philosophical Writings, vols. 1-2. Bloomington: Indiana University Press. [MS] The Charles S. Peirce Papers. (1966). 32 microfilm reels of the manuscripts kept in the Houghton Library. Cambridge, MA: Harvard University Library, Photographic Service. [NEM] The New Elements of Mathematics (1976), v. 4, ed. Carolyn Eisele, The Hague: Mouton. [R] Peirce, C. S., & Robin, R. S. (1967). Annotated catalogue the papers of Charles S. Peirce. (RS Robin, Ed.). Amherst, MA: University of Massachusetts. [cited as MS, followed by the number of the manuscript]. [W] Peirce, C. S. (1982-2000). Writings of Charles S. Peirce: A Chronological Edition, vols. 1-6, M. H. Fisch et al. (eds). Bloomington: Indiana University Press.